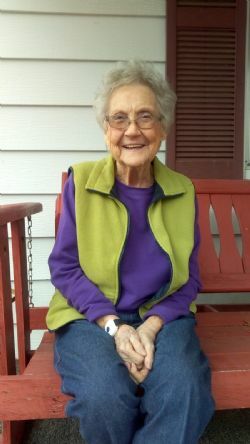 Nina Ackerman, 94, of Mountain View, Arkansas passed away on Friday, April 12, 2019 at Stone County Medical Center in Mountain View, Arkansas. Nina was born on March 16, 1925 in Whitesville, West Virginia to the late R.H. and Cora Ellen (Cowan) Blaylock. Nina was a member of First Baptist Church in Mountain View, Arkansas and was a very good cook; her specialties were spaghetti, cornbread, and potato soup. Nina will be greatly missed by all of her loving family and friends. Nina is survived by one son, Stan Ackerman and wife Sandy; daughter, Connie Bierman and husband Bill; three grandchildren, Suzanne Bierman, Jonathan Bierman, and Joseph Bierman; two great-grandchildren, Jonas Veach and Brooke Bierman; along with many extended family and friends. Nina was preceded in death by her parents, R.H. and Cora Ellen (Cowan) Blaylock; husband, Lona Ackerman; infant child, Rodney Michael Ackerman, and eleven siblings. Visitation is Tuesday, April 16, 2019 from 1:00-2:00 PM at Roller Crouch Chapel in Mountain View, Arkansas. Funeral services are Tuesday, following the visitation beginning at 2:00 PM with Brother Ray Brown officiating. Interment will follow the service at Fox Cemetery in Fox, Arkansas. Pallbearers are Justin Nelson, Calieb Callahan, Douglas Daniel, Robert Thomson, Graham Carr and Peter Carr. Click Play below to view the Video Memorial for Nina Ackerman. If you would like to order a DVD copy of the video, please contact the funeral home at 870-269-3210.